Joe Smith: According to Brayden Point‘s agent Gerry Johannson, their plan is still to start contract extension talks with the Tampa Bay Lightning after the season. They are open to a bridge deal to a five-year deal to an eight-year deal. Point loves playing in Tampa and wants to make it work. Joe Smith of The Athletic: Gerry Johannson represents Point as well as Carolina Hurricanes Sebastian Aho. Johansson on Auston Matthews five-year extension with Toronto Maple Leafs. Joe Smith of The Athletic: The Lightning have let 33-year old Ryan Callahan know that he’ll be there 13th forward going forward. He’s been a healthy scratch for three of their past four games. Callahan has one year left at a $5.58 million cap hit with a modified no-movement clause – 15 team trade list. The Lightning haven’t approached him about a trade yet. 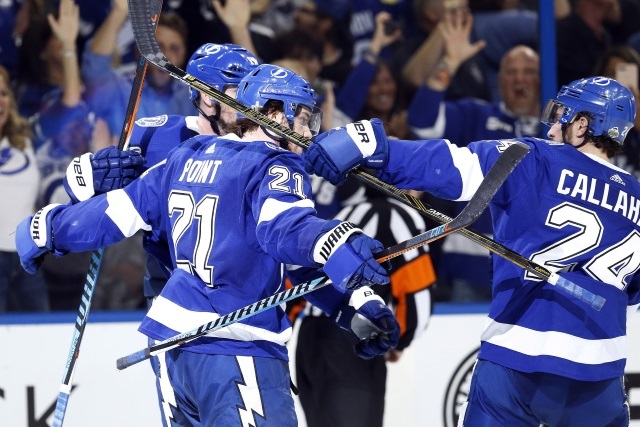 Given the salary cap situation for the Lightning next year – about $73 million for 16 players – and Brayden Point needing a new contract, the Lightning may consider a buyout or trading him. Callahan and his agent Stephen Bartlett knew the cap issues would be there. The Lightning don’t appear to be shopping Callahan and if there is an injury, he could be valuable.